Giovanni Battista Pacetti was born in Città di Castello. He acquired the nickname “lo Sguazzino" because of his slap-dash methods: “sguazzare” means to splash. ✴the funeral of the the Blessed Margherita. 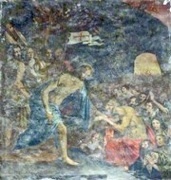 •the resurrection of Giustolo da Marzano. ✴SS Floridus and Amantius kneeling in a landscape, with the Castel Sant’ Angelo in the background and other saints to the sides. The altarpiece in this chapel, which depicts the Virgin in glory looking down on Tobias and the Angel, was restored in 2010. The panel on the left wall of this chapel depicts the Virgin interceding with Christ for souls in Purgatory. The panel on the left wall of this chapel depicts the Crucifixion with SS Nicholas of Bari, Floridus, John the Baptist and Francis. The panel (ca. 1630) on the right wall depicts the Virgin and SS Floridus, Sebastian and Roch, who implore Christ to save Città di Castello from the plague. The Duomo and its circular campanile are at the centre of the landscape in the lower part of the composition. The painting was almost certainly commissioned during the serious outbreak of plague in 1630. This panel above the door to the sacristy of the Chiesa di Buon Consiglio (to the right of the high altar) is by/attributed to lo Sguazzino. 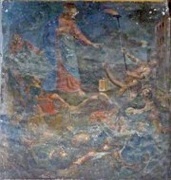 It depicts St Crescentian on horseback, killing a dragon. ✴two oval panels depicting unidentified male martyrs. This panel in San Francesco, which is attributed to lo Sguazzino, came from San Bartolomeo. •SS Francis and Clare on the right. This altarpiece on the left wall of Santa Maria Nuova, which is attributed to lo Sguazzino, depicts the Madonna and Child enthroned with saints and angels. The following works are from San Domenico, Bevagna. ✴the surrounding figures of the Virgin and SS Catherine of Alexandria and Mary Magdalene are attributed to Andrea Camassei. This damaged altarpiece is signed by lo Sguazzino and dated. It depicts the miracle of the Crucifix that spilt blood over the Blessed James Bianconi as he prayed before it. These 26 frescoes by lo Sguazzino in the cloister celebrated the beatification of the Blessed James Bianconi. They are now badly damaged and most are illegible. This altarpiece on the Altare di Santa Monica of Santa Maria Maggiore is attributed to lo Sguazzino. Return to Art in: Bevagna; Città di Castello; Spello.